The WHZ4178 is a full-featured Wi-Fi 802.11b/g/n module that includes support for high linear output power and IEEE 802.11i security. 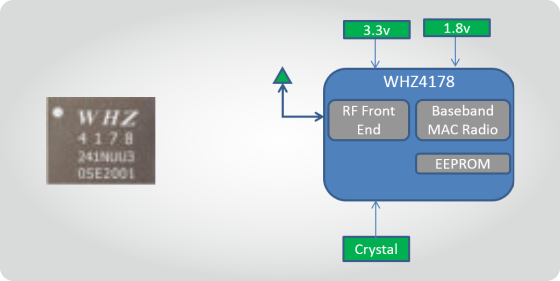 WHZ4178 is an embedded IEEE 802.11bgn WiFi SMD module and need crystal, voltage regulator and antenna connector. Module supports client and SoftAP mode. Module supports SPI & SDIO interface and has support for no OS, RTOS or Linux based platforms, so you can use the module across your multiple product lines providing you a benefit of lower product cost, inventory cost and learning cost. WHZ4178 is fully integrated 56 pin, small size. A small form-factor of 9mm x 11mm x 1.3mm reduces board space and low memory footprint WLAN software for no OS, RTOS & embedded linux provides a wireless (WLAN) connectivity to micro-controller based products. The module is available in small to very large quantities. Module supports -40 to 85C. The module is a complete stand-alone device with a small footprint which makes WiFi technology easy to embed into new or existing designs. 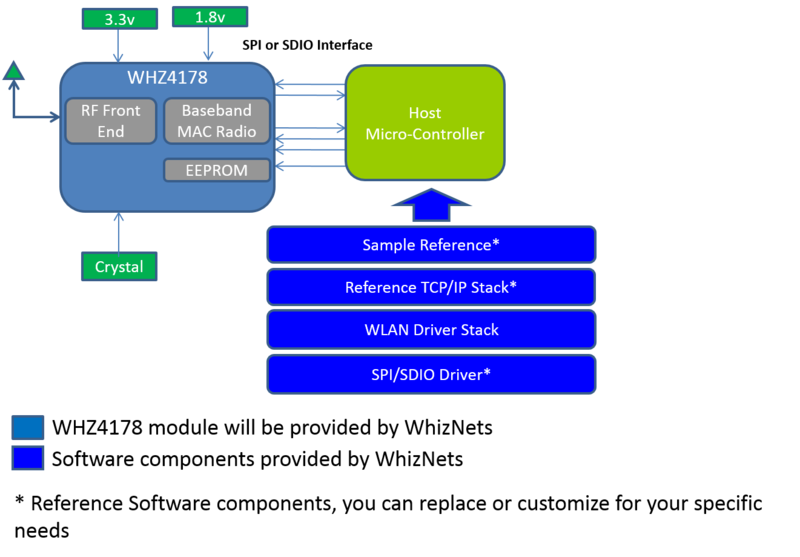 The module provides an SPI/SDIO interface to communicate with a variety of host devices. The pre-tested module eliminates the need to create custom WLAN designs, resulting in greatly reduced development risk, costs and time-to-market. Smartphone / PDA / PDA phone / WiFi phone / DSC/ DVC with WiFi connectivity. For Linux SDK requirements of SDIO interface, we work together with you to provide a ported SDK for your platform-specific needs. Contact us for discussion on your requirements and a custom quote. Copyright © 2007 - 2019 WhizNets Inc.